A MAGAZINE FOR REAL WOMEN? You have no idea how I have longed to use that phrase. Are you picturing me working in a fabulous office where, a constant stream of products drop onto my lap seeking my imprimatur? In fact my desk is in my emigrant eldest daughter’s bedroom, where I work at a desk facing a purple wall!! But I digress…. Regular readers will know that I harbour a dream of upping sticks and moving out of suburbia and into the country. Wexford or Kilkenny would probably be my counties of preference as I would not like to be too far from the city of my birth. I have been known to while away long hours when there’s nothing on the tellybox, surfing websites such as DAFT and MyHome looking for my alter abode. In fact if I am to be truthful I actually have a saved list of properties on DAFT and on a day when I need to dream a different life I visit this list and drool over these quirky houses with orchards, vegetable patches, room for donkeys and hens… sigh. My other dream is to bail out of life for a year and rent a cottage on the Aran Islands….. but that’s another story! Suffice to say that although a Dub born and bred I seem to have the call of the country somewhere deep within my soul! Perhaps this stems from the generally happy memories of Irish Farm family holidays in the 70s. Women’s magazines drive me nuts regularly… with their over emphasis on beauty and fashion and dieting!! Pages and pages of impossibly gorgeous, very skinny, very young women interspersed with only perhaps one meaty article worth reading. I know this is a massive generalisation and it does seem to apply more to UK than Irish magazines but still after years of trying everything from Cosmopolitan to Prima and Good Housekeeping I have given up. I rarely buy magazines now… as a 50 year old woman with only a passing interest in clothes and makeup, I find them just too depressing. 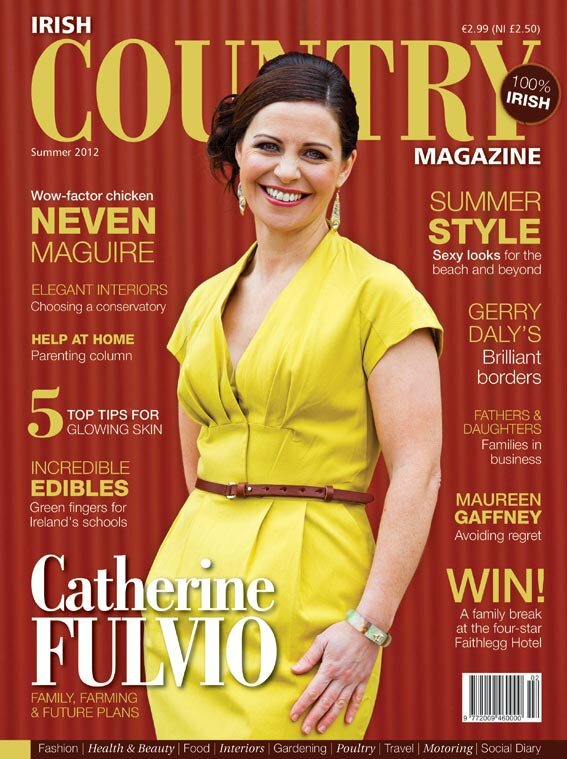 When I cast a cold eye over the cover of the new Irish Country Magazine (from the Farmers Journal, dontchya know… yee haw) I was delighted to see a photo of a real woman, Catherine Fulvio, – looking beautiful but normal! Some Irish magazines have often been guilty of taking Irish celebrity women and totally over-styling them so that you have to look twice to recognise who they are! I am happy to say that my delight in the cover of ‘Irish Country Magazine’ continued as I perused the innards of this new publication. I found meaty articles aplenty and some beautiful writing. I was particularly taken with a column by Cherone Duggan who is an Irish farmers daughter studying in Harvard and who wrote about the joy of rain. I hope she will be a regular contributor. There is also a feature on daughters and fathers, and a wellbeing section which leads with an article by that wonderfully wise woman, Maureen Gaffney about regrets. There is one fashion shoot (and again is not over styled but relatively normal looking), there is one beauty feature but there is also lots of gardening, interiors and food (with Neven Maguire and cover woman Catherine Fulvio). So if you, like me, are not a fan of women’s magazines (‘cos they make you feel cross and depressed), perhaps have a look at Irish Country Magazine…. I liked it. It costs €2.99 and is quarterly. The summer edition is in shops now. Now… I wonder would they consider a column by a Dublin ole wan who decamps to Inis Oirr for a year? HAVE MARKETING DEPTS LOST THE PLOT OR WHAT? I love your blog Barbara…..and I also love the new Irish Country Magazine. I think this magazine is good for all moms out there, even they are full time mom or working mom. Sometimes they forgot to pamper their self because they always put first their family.